Campus Activities Board were all smiles welcoming students to Club Day in January 2016. 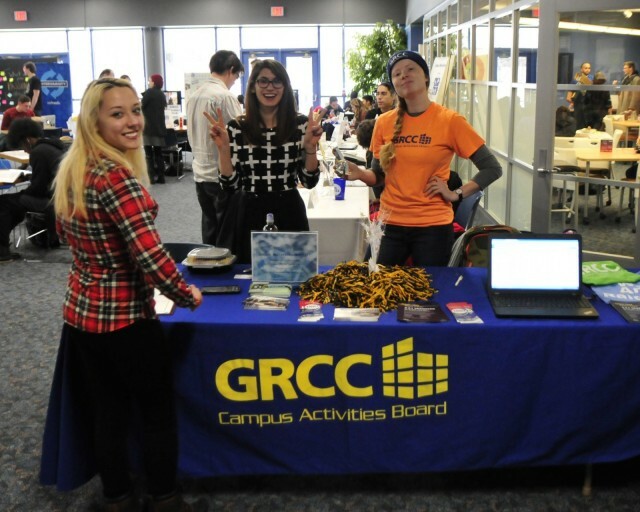 Student Life and Conduct at Grand Rapids Community College is looking for a diverse and competitive pool of student leaders to apply to the Campus Activities Board. Applications for these positions are due Friday, April 12. Elections will be held at 1:15 p.m. on Friday, April 19. Students will be building leadership skills and getting experience. These are paid positions with stipends paying between $750 and $2,200 per semester depending on the position, and students will be doing a lot for the campus and other students. Responsibilities of the positions include planning homecoming, finals relaxers, the leadership banquet and welcome week. Interested applicants can submit a one-page letter explaining what position they are applying for and why they are interested in becoming a CAB team member. Thalia Guerra-Flores, the assistant director of Student Life and Conduct, says she wants to see a variety of candidates applying for the positions. Guerra-Flores also mentioned the responsibilities of the positions and the effort the chosen candidates will have to make to be successful.